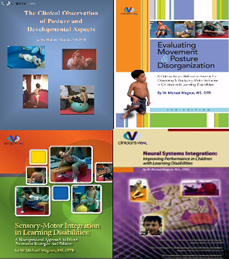 A combined package of all Mr. Magrun's learning diisabilities resources for a fraction of the individual price purchase.This 4 manual and 3 DVD learning disabilities package covers developmental aspects of learning disabilities, postural observation and analysis, evaluation of postural disorganization, and comprehensive treatment strategies. This text presents a detailed analysis of observational characteristics of postural disorganization. Developmental aspects of learning disability are discussed and contrasted with normal developmental experience to provide a more complete understanding of the origin and progression of movement and posture disorganization in learning disabilities. This video discusses the differences between normal developmental experiences and the experiences of children who develop motor disorganization and coordination problems. Understanding compensatory developmental characteristics that lead to poor transitional movement components and efficient functional skills, can help therapists improve their observational skills and treatment planning for this population. Evaluating Movement and Posture Disorganization (3rd Edition) Manual. This video demonstrates each movement sequence, postural alignment, and analysis of movement components. Normal responses are contrasted with disorganized motor performance. The viewer is guided through administration of each subtest, observation, interpretation, and treatment implications. This expanded 3rd edition includes description and demonstration of specific treatment techniques as well as additional examples and explanation of treatment procedures, Children with learning problems are too often labeled and categorized without a careful analysis of their functional learning skills. The ability for children to be successful in developing learning strategies depends in large part on the integration of their sensorimotor processes. These processes require the organization of movement and posture and the sensory components involved in the task. Integrated motor patterns are most likely to develop when proper alignment, postural tone, weight distribution, and mechanical advantage for efficient muscle synergies are facilitated through active physical handling. Direct physical handling and facilitation techniques for establishing a neuropostural foundation for children with motor disorganization are demonstrated. This text provides the neurophysiological explaination for how neural systems affect efficient functional performance.This text discusses, explains, and explores the interactions of various systems within the central nervous system, and establishes an understanding about the dynamic interplay of the visual, vestibular, and somatosensory systems. Emphasis is placed on how sensorimotor systems interrelate, weight and re-weight, influence, modify, and cooperate in the development and active initiation of functional performance, beyond what might be usually considered in clinical practice. It is the goal and purpose of this text to present the powerful interrelationships of sensorimotor systems and how they can be influenced clinically to improve efficiency and performance..